Yahoo! Welcome to the first day of the Sydney Taylor Book Award Blog Tour. 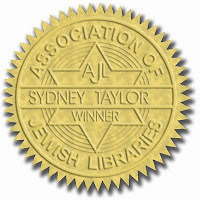 Every year, the Association of Jewish Libraries (AJL) presents the Sydney Taylor Book Awards to outstanding books for children and teens that authentically portray the Jewish experience - and the winners are celebrated and showcased through a blog tour! Please tell us: Why do you illustrate for children? What keeps you motivated or inspired? I illustrate for children because it's fun as well as challenging to create pictures with a child's view in mind. What is your studio or work space like? My studio is in my home, in a rural part of the Maine coast. It sits on the edge of a field that rolls down to the ocean. [Sounds beautiful!] This view means a great deal to me. The big open space seems to say "anything's possible." The beauty of the changing seasons, the many animals I see pass (I've seen moose and bobcats from my studio windows, as well as the more common critters), and the lovely air that floats in, all serve to inspire my work. The work space itself is kind of cluttered, full of art materials and large work tables and reference materials. What was your creative process for Naamah and the Ark at Night? Naamah and the Ark at Night was created by watercoloring large sheets of paper with color and patterns, cutting the necessary shapes, then assembling them into pictures. Details were added last. Before this, the entire book was drawn in black and white, using imagination and reference materials. I referred closely to this when constructing the illustrations. 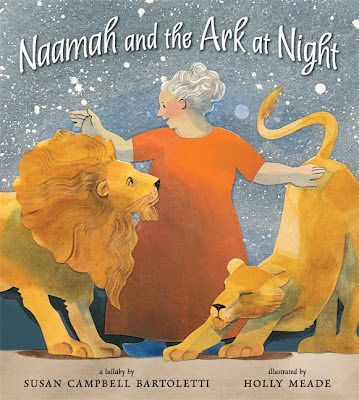 What was your favorite part about illustrating Naamah and the Ark at Night? What was the most challenging part? I guess my favorite part was working with such an old and well loved story, but with the wonderful new view point of Naamah. The most challenging part was selecting which animals to include. You have several awards, including a Caldecott Honor for Hush! A Thai Lullaby, written by Minfong Ho (Scholastic, 2000); a Charlotte Zolotow Award for Creative Writing for John Willy and Freddy McGee (Marshall Cavendish Children's Books, 1998); and now a Sydney Taylor Honor. What do these awards mean to you? They're affirmations that these books are meaningful to children, and that's meaningful to me. Congratulations again, Holly! And thank you for taking the time to answer my questions. Dear readers, please visit Ima On & Off the Bima for an interview with the author of Naamah and the Ark at Night, Susan Campbell Bartoletti. And click here for the rest of the stops on the Sydney Taylor Book Award Blog Tour! Such gorgeous illustrations! I'm glad to get a peak into the process. Looking forward to the rest of the Sydney Taylor Blog Tour as well! Tarie and Holly, thanks for this wonderful interview! I know there were some technical difficulties with getting it done (darn computers!) so thanks also for your perseverance!